What Goes Into An Invitation? Response Card (a.k.a. RSVP) - Can be included with an envelope or without, such as postcard style. Reception Card - Used when your wedding is at a different location than the reception. Hotel Accommodations - To inform out of town guests where to stay and group rate information. Map and/or Directions - Detailed location information for your wedding and reception. Events Card - Invite guests to events, such as morning golf or next day brunch. Rehearsal Dinner Invite - Sometimes included for those guests you wish to have apart of your rehearsal plans. Wedding Website Card - Often used instead of all other inserts. Directs guests to your wedding website that contains all of the details of the wedding and surrounding events. Along with things you should include in your wedding invitation, etiquette also states a few things you shouldn't. We strongly advise against putting anything about your registry in your wedding invitations. (However, it is perfectly acceptable to put in your shower invites.) 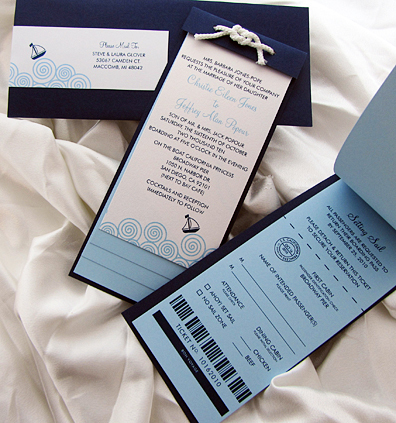 The purpose of the wedding invitation is to invite guests to the wedding and/or reception, not to ask for gifts. A great way to convey this information is to include it "For more information, please visit" and your wedding website address somewhere in your invitation suite.